"Mark Derryberry has one of the best set of ears with which I’ve ever had the pleasure of working. He is a sharp, knowledgeable and efficient sound designer and engineer - and one very caring human being. I have worked with Mark all over the U.S. in many challenging venues. As well, I have enjoyed the benefit of his expertise for over 20 years and innumerable recording projects." "Mark is a wonderfully skilled audio engineer, and also can act as a subjective voice in making decisions about what was just recorded, or what needs to be done. He is very fast on editing and working at the pace of the musicians. Great person to work with, and I highly recommend him to anybody looking to have an excellent sounding product." "I've known Mark for most of his life and have watched him grow in to a highly respected professional businessman. He has grown his company from the ground up by hard work and now he has many repeat clients who recognize his talents." "Experience, passion, attention to detail all come together as exceedingly high quality results. 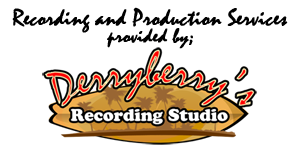 If you need sound, for any reason, you need Derryberry's." "I met Mark at Fanfare in 1998. Been using his mastering services and getting all my colleagues to do the same for many years now. It's like a tattoo artist. You begin to attach to the great experience of the person, rather than the art alone. I have the tools to master my own music, but Mark allows that smooth, other, professional ear. 5 STARS!!"